Before we delve into the specifics of the Hizen School perhaps it would be a good idea to discuss some important historical events of the Keicho Era that led to the differentiation between what we classify as Koto (Old Sword Period) swords and Shinto (New Sword Period) swords. The Keicho Era started in 1596 and swords made before this time are called Koto while those made after this time are called Shinto. There is a great significance in fixing Keicho as the transition period, and the distinction should not be made merely based on whether the swords are older than that period or not. The distinction is based not only on the changes in style and appearance of the swords, but also on some fundamental and substantial social and historical changes that were occurring at the time. During the Koto period the centers of sword manufacture tended to be in places controlled by powerful clans or religious institutions. They had local production of quality sand iron to be used as raw material in the swordmaking process. With the advent of the Azuchi/Momoyama Era of Oda Nobunaga and Toyotomi Hideyoshi, and most importantly, the long period of peace brought about by the Tokugawa Bakufu during the Edo Era, the power distribution within the nation changed dramatically. The large temples and shrines were deprived of their right to maintain their own armies. Instead, the Daimyo were endowed with authority from the central government to govern certain localities as feudal lords in communities surrounding a castle. Thus Jo-ka Machi or “Castle Towns” came into being. For the first time in history, these castle towns together with such great cities as Edo, Kyoto, and Osaka became the centers of sword manufacture. The second major change is in the raw material used for sword making in that it became substantially different from what was used during the Koto period. Due to the relative peace throughout the country and improved roads creating easy transportation, raw material could be transported from its area of origin to the castle towns and other centers of swordmaking. For the first time in history it was no longer necessary for a major swordmaking area to be able to provide the sand iron. It could now be imported. This, in turn, brought forth a drastic change in the quality and nature of the steel produced from raw iron. The so-called local colors that were apparent in the steel of the Koto blades faded with the advent of the new sword period. Add to this the fact that this was also the time of the beginning of international trade with the West. This led to the importation and use of foreign steel known as Namban-tetsu from Holland and Portugal. The fourth factor causing differences between Koto and Shinto is the change in battle strategies and the development of swordsmanship (kendo). The very style of wearing swords changed. The highly-curved Koto blades of the mounted Samurai were worn slung from the hip with the cutting edge down. This gave way to the new Shinto swords, which had less curvature and were worn thrust through the sash with the cutting edge upward. Battles and the very nature of swordsmanship changed. Infantry actions became common wherein large numbers of unmounted Samurai needed to be able to draw their swords quickly and hold them with two hands. This led to less curvature, longer nakago, and the center of gravity being placed somewhat closer to the tip of the sword. These changes can be seen in the many remaining examples of long Nanbokucho tachi that were shortened and worn by the unmounted Samurai. In fact, what is known as the Keicho-Shinto shape came directly from the shape of this shortened older tachi. They tend to be wide with very little difference in width from the machi to the boshi. 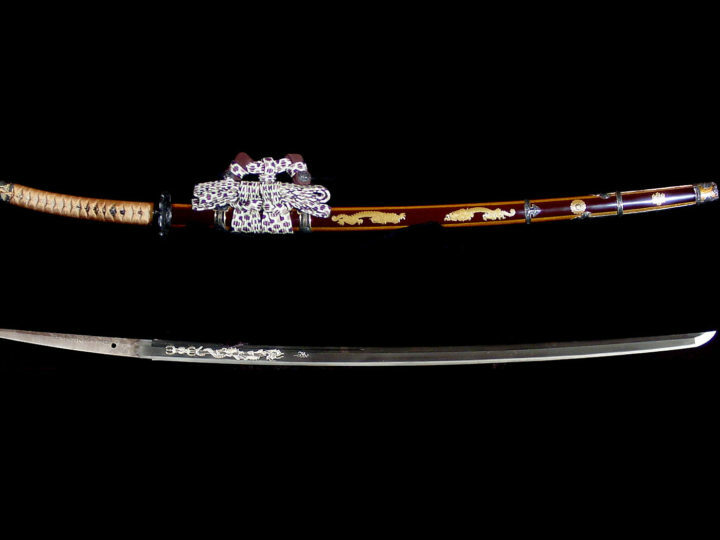 As the Shinto Era progressed the influences from the Momoyama culture decreased and swords began to show their own unique characteristics. Hizen province was under the control of Todaiji temple after the Kamakura period. During the Sengoku period, the Ryuzoji clan of Saga tried to expand its influence but was defeated by Toyotomi Hideyoshi who divided the province and gave it to the Nabeshima, Matsuura, Omura, and Goto families. Of these, the Nabeshima was the biggest and most powerful and even under the subsequent reign of the Tokugawa could maintain its huge landholdings assessed at 350,000 koku of annual rice production. Geographically Hizen Province has always been one of the most significant areas in Japan’s long history. It is located on Kyushu Island between the important ancient trade ports of Hakata (later Fukuoka) and Fukae (later Nagasaki). Control of such an important highway linking these two ports resulted in the construction of Saga castle, which became the seat of the Nabeshima clan from the Keicho period up until the Meiji Restoration. The Hizen School of swordmaking (generally known as the Tadayoshi School) was a flourishing industry that was a valuable earner of currency for the Nabeshima clan. This was a result of the efforts expended by the Hizen Daimyo to place a priority on the promotion and development of the sword and ceramics (Imari-yaki, Nabeshima-yaki, Arita-yaki) industries. The Nabeshima Daimyo realized that a solid economic base would be necessary if they were to recover the huge amounts of funds they were forced to expend on Toyotomi Hideyoshi’s failed Korean invasions in which they played a major role. Based upon the generous patronage of the Nabeshima family, the Tadayoshi line of smiths could devote themselves to the sword making industry. 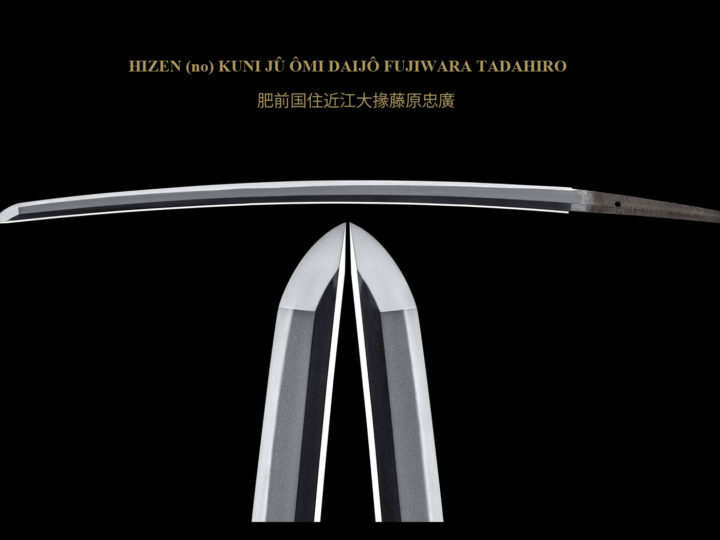 There are a strikingly large number of Hizen school swords extant today. Among these, the works of the second generation, Omi Daijo, are conspicuous for their number. During the Edo period, the evaluation of the second generation was extremely high and these blades enjoyed wide use. They were worn in every area of the country, which indicates that the entire school (some say as many as sixty smiths) were engaged in helping the second generation meet this demand. I mention this anecdote to emphasize that we are truly talking about a sword making industry. SUGATA: The sori is torii-zori or chu-zori. The kissaki varies with ko-kissaki, chu-kissaki and o-kissaki, but the chu-kissaki is, by far, the most common. Tanto are comparatively few, but occasionally, in addition to hira-zukuri, kiriba-zukuri is seen. As for katana and wakizashi, iori-zukuri is usual, but in tanto, there are also mitsu-mune. JITETSU: It is extremely fine and tight. It is comprised of a dense ko-mokume hada, which is known as konuka-hada. Occasionally, there might be one in which a ko-itame hada appears. 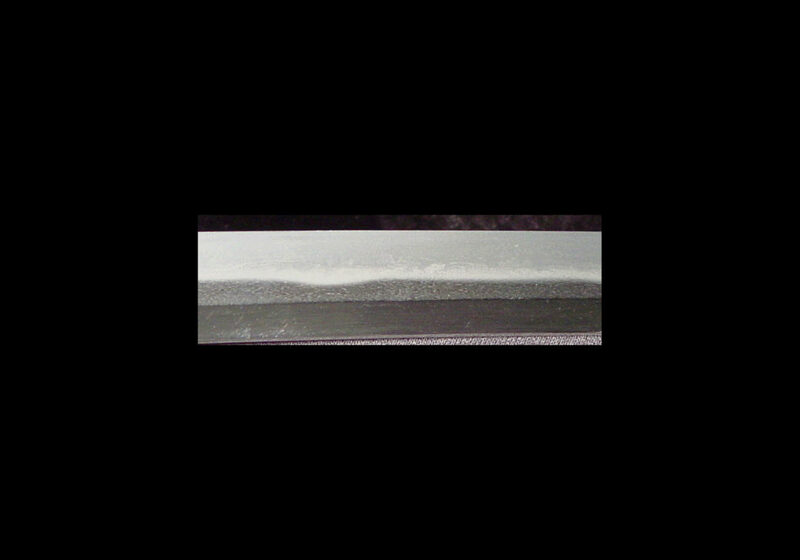 Dark spots called sumigane resembling those seen in the work of Enju and Aoe appear here and there and are one of the characteristic features of Hizen swords. HAMON: Suguba, suguba hotsure, o-notare, and choji-midare are the most common. Occasionally there are some with gunome-midare and o-midare. Chu-suguba consisting of Yamashiro-tradition nie is most likely to be classified as a Hizen specialty. In every case, there is ko-nie in the habuchi without any clustering, and the nioi line is wide. When it is choji-midare, the kashira of the choji are round with long ashi. When it is suguba, there are some with absolutely no ashi, but the usual is for ashi to be inserted here and there. Another interesting feature to be observed in some of the Hizen smith’s blades is the presence of what is known as abu-no-me (wasp eyes) present in the gunome. These are pools of nie (Yo) that are present within a double gunome structure. Occasionally some of the generations of Tadayoshi smiths will have tobiyaki in the form of a sun (circle) of nie on one side of the blade and a moon (crescent) on the other side of the blade. These are important kantei points to look for. BÔSHI: Those returning in ko-maru are the most common, but there are also some that are midarekomi. The often-used term, “Hizen Bôshi” has a uniform width from the yokote to the tip and is a standard ko-maru bôshi. HORIMONO: There are various types, but shin no ryu, kurikata, sanko tsuka ken, and bonji are the most common. They are skillfully executed. Those of the early period are all beautifully done and the pattern is the Umetada style. This can be attributed to the fact that the Shodai Tadayoshi studied with Umetada Myoju for about three years starting in 1596. NAKAGO: As for the mune, kaku-mune is the most common, but there are also ko-maru mune. The saki is kurijiri, kengata, or katayamagata. The yasurime is usually yoko or sujikai without any kessho yasuri. MEI: Rarely there is a ni-ji mei (two-character signature), but usually a naga-mei is inscribed. Customarily in wakizashi and tanto the mei is inscribed on the sashi omote which is the same as the works of various other schools. Katana, however, are always inscribed on the sashi-ura, in other words, in the so-called tachi-mei. MISC. : Hizen blades are said to have the most stylish shape of all Shinto works, which opinion is probably based on their perfectly balanced curvature. 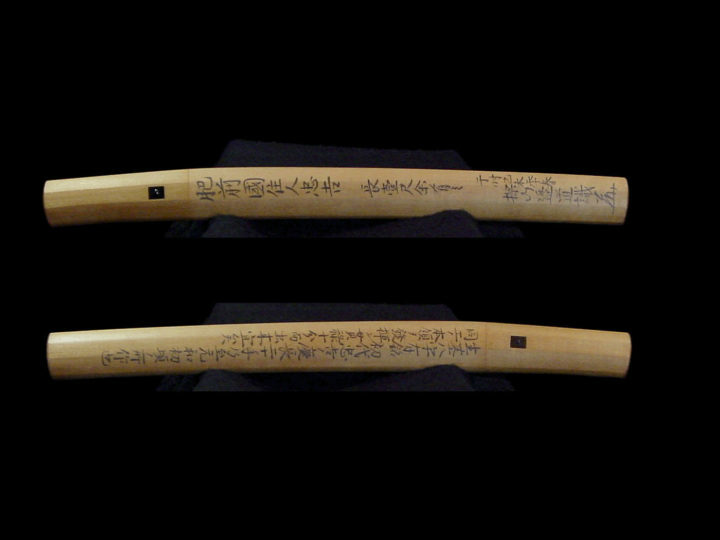 The most popular length was 2 shaku and 2-3 sun (66.7-69.7cm). The Hizen works have a beautiful jihada, but since the kawagane (skin steel) is thin, there are frequently works where shintetsu has crept out. 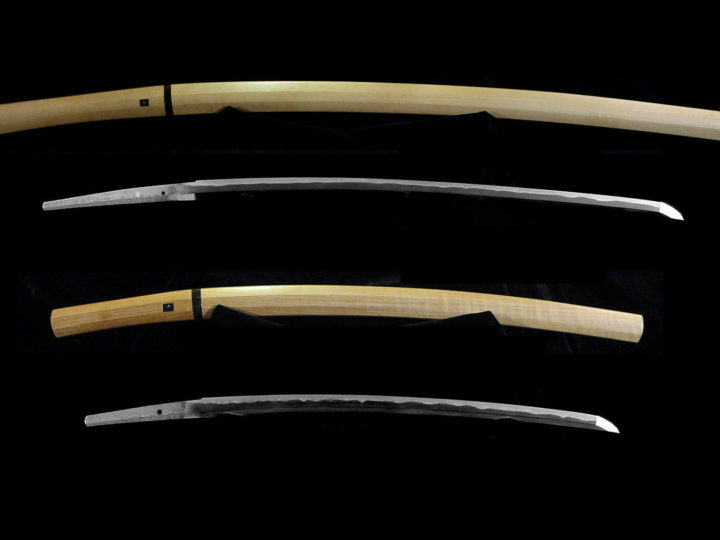 Not withstanding this trait, Hizen blades have, throughout their history, been highly sought by both Samurai and modern day collectors. The preceding paper is, primarily, a compilation of materials from several sources. I threw in a few original ideas and thoughts just to keep it interesting and to make me stretch the boundaries of my scholastic skills.